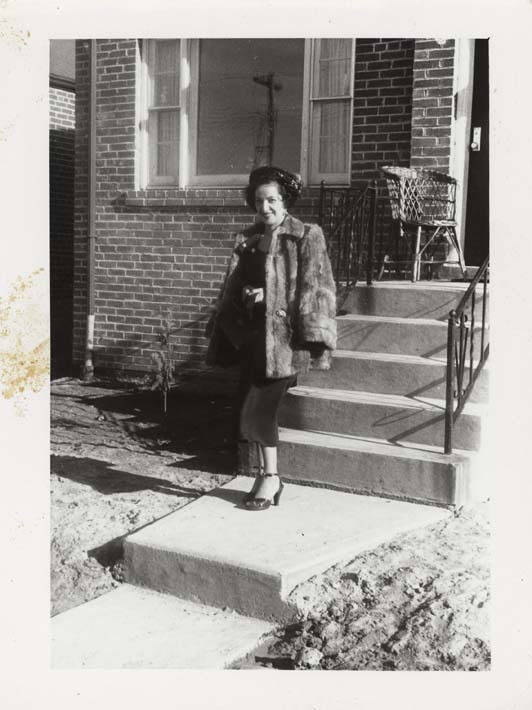 This is a black and white snapshot of Antoinette (Toni) Ciccarelli standing outside a house. She is wearing a fur coat with a dark coloured outfit (either a two piece set or a dress). She is wearing a hat and strappy sandals. She is smiling straight into the camera. The brick house has a big white-framed window and a dark coloured door with a white frame. The little porch area has a chair. The landscape is almost bare, as there is no grass and only a small bush in the background.